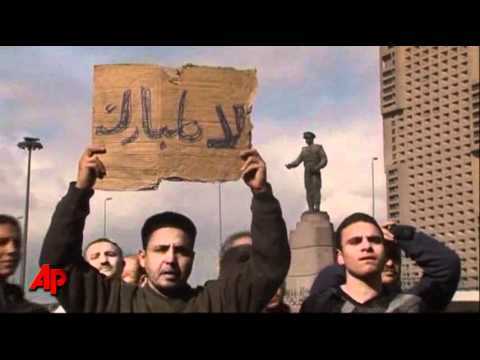 Protests Have Broken Out in Egypt: "Mubarak, Get out!" Inspired by Tunisian demonstrators, thousands of Egyptian protesters on Tuesday gathered in Cairo and other major cities, calling for reforms and demanding the ouster of President Hosni Mubarak, The anti-government protesters, some hurling rocks and climbing atop an armoured police truck, were chanting slogans against Mubarak, who has ruled the country for three decades.Downtown Cairo came to a standstill with protesters chanting slogans against the police, the interior minister and the government, in scenes that the capital has not seen since the 1970s. 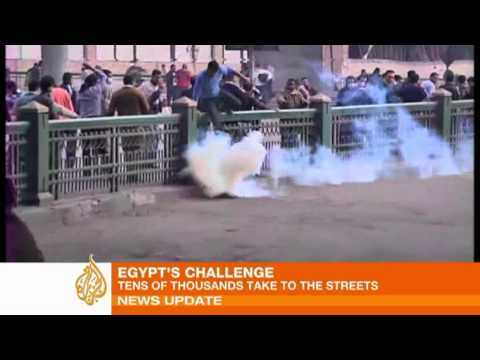 Police fired tear gas to disperse thousands of protesters in the capital, Cairo. Several people are said to have been injured. More than 30,000 police have been mobilized in the city centre to launch a crackdown on the protesters. Some have gathered outside the Supreme Court, chanting slogans against President Hosni Mubarak, who has been in power for three decades, and his government. 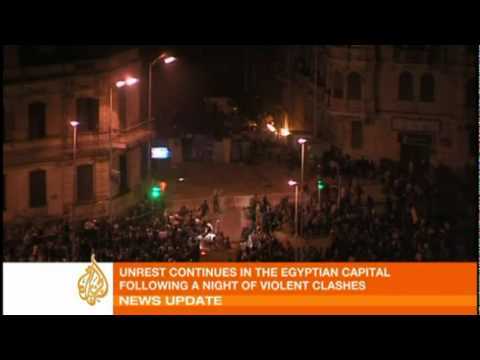 Protests have also been held in other parts of the country, including the Mediterranean city of Alexandria. The events have been inspired by the recent revolution in Tunisia. "Zine El Abidine -> who is coming next?" the protesters shouted. Organizers say it is a day of revolt against torture, poverty, corruption and unemployment. But police responded with blasts from a water cannon and set upon crowds with batons and acrid clouds of tear gas to clear demonstrators crying out "Down with Mubarak'' and demanding an end to the country's grinding poverty.At least 30 people have reportedly been arrested in Cairo, according to official sources.Protests also broke out in the Mediterranean city of Alexandria, the Nile Delta cities of Mansura and Tanta and in the southern cities of Aswan and Assiut, witnesses said.Earlier on Tuesday, Rageh reported from the protests, calling them "unprecedented" in the leniency showed by security forces who allowed demonstrators to march through the capital. The Egyptian government had earlier warned activists hoping to emulate Tunisian pro-democracy protesters that they faced arrest if they went ahead with Tuesday's mass demonstrations, which some labelled the "Day of wrath". The rallies have been promoted online by groups saying they speak for young Egyptians frustrated by the kind of poverty and oppression which triggered the overthrow of Tunisia's president. 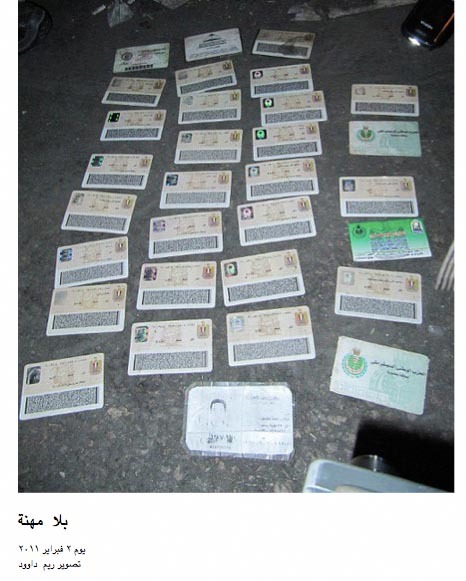 Mamdouh Khayrat, 23, travelled from the governorate of Qalubiya to attend protests in Cairo. He spoke to Al Jazeera's Adam Makary. "We want a functioning government, we want Mubarak to step down, we don't want emergency law, we don't want to live under this kind of oppression anymore," he said. "Enough is enough, things have to change, and if Tunisia can do it, why can't we?" Khayrat added. Black-clad riot police, backed by armoured vehicles and fire engines, have been deployed in a massive security operation in Cairo, with the biggest concentrations and likely flashpoints, including: the Cairo University campus, the central Tahrir Square and the courthouse where protesters are said to be gathering. Coinciding with a national holiday in honour of the police, a key force in keeping president Mubarak in power for 30 years, the outcome in Egypt on Tuesday is seen as a test on whether vibrant Web activism can translate into street action. "In fact, the call originated from a Facebook page initially set up to honour a 28-year-old man from Alexandria who activists say was tortured to death by police. "Witnesses are telling us that there are hundreds on the streets. This is an indication that the protests seem so far to be larger than the usual protests that have taken place here in Egypt over the past few years." "I tell the public that this Facebook call comes from the youth," Adli said in an interview published by the state-owned newspaper al Ahram. "Youth street action has no impact and security is capable of deterring any acts outside the law," he said, adding that he welcomed "stationary protests held for limited periods of time" and that police would protect the protesters. Commenting on the wave of public unrest in Tunisia, Adli, the interior minister, said talk that the "Tunisian model" could work in other Arab countries was "propaganda" and had been dismissed by politicians as "intellectual immaturity". "Young people are very excited, and this time there will be much more than any other time," Ahmed Maher, one of the founders of the opposition youth movement said. There are further reports with video reported on BBC website here. 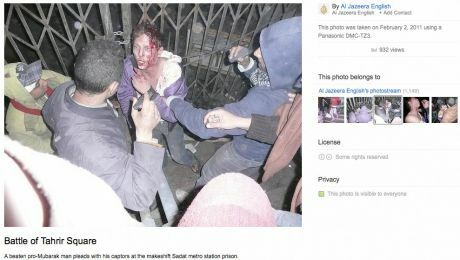 In the past few days the media had been suggesting these were rather low key, but it appears they are not because we have to remember that the State is so repressive in Egypt that few people would normally risk going out on the streets to protest which means now that there are thousands out this is really significant. 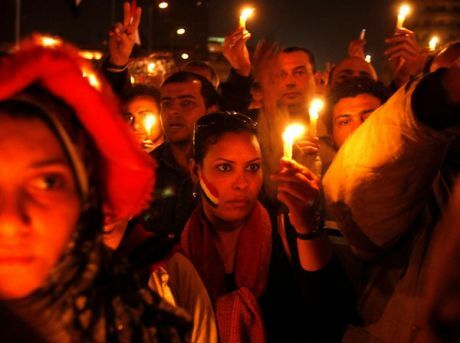 The Egyptian Interior Ministry said earlier today that no new demonstrations will be allowed . Three protesters died in the port city of Suez, east of Cairo, during Tuesday's unrest, and a policeman was also killed when he was hit in the head with a rock in Cairo, an interior ministry official said. Al Jareea reports that despite the ban demonstrations are continuing . More than 500 protesters have been arrested today . US Secretary of State Hilary Clinton has expressed confidence in the government of Hosni Mubarak , but the financial markets do not seem so sure : the FT reports that the Egyptian bourse has plunged 4.2 per cent since the Tunisia-inspired protests . Many protests in support of the demonstrations have been called across Europe. The Egyptian embassy in Ireland is located at 12 Clyde Road , Ballsbridge. There are reports that Egypts president's son and family have fled to the UK. President Mubarak who has ruled Egypt for decades with an iron fist obviously feels his family will be welcome in Britain, a country which is a major exporter of arms and tools of repressive to many barbaic regimes like Mubaraks. Given the drift throughout all European countries and particulary the UK towards totalitarian police states over the past two decades, Mubarak and his extended family who have looted the country for years will certainly feel very much at home. ......Over 30,000 anti-government protesters had gathered. in Cairo's Maidan al-Tahrir square to take part in the 'day of anger', the spokesman for Egypt's '6 April' opposition movement, Mohammed Adel, told Adnkronos International (AKI) in an interview. "Police used tear gas and water canon to break up our protest and they arrested 40 of us, but we don't have official figures on the numbers of arrests across Egypt," said Adel. If Egypt is rid of a thug like Mubarack then there is hope for the Middle East. It is to be hoped that the "disease" will spread to the rest of that gangster-run region. I hope it's true as well. I wouldn't be too hopeful though. Mubarak is a tough ol' cookie who is likely to fight it out to the last. 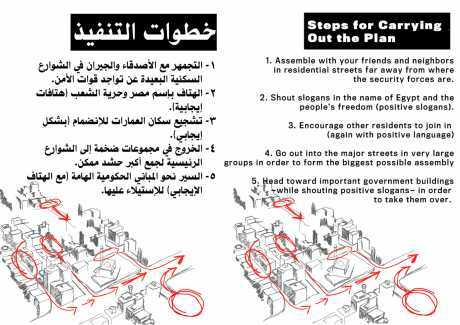 Protestors are promising to hold the biggest demonstrations yet tomorrow after weekly prayers. 'Egypt's Muslims and Christians will go out to fight against corruption, unemployment and oppression and absence of freedom,' wrote an activist on a Facebook page. Up the revolution . Hopefully the disease will spread to these gangster shores as well . A solidarity demo has been called for tomorrow 3-5pm at the Egyptian embassy . 6 dead, police station burned, government building set on fire, thousands on streets, many injured, many detained... 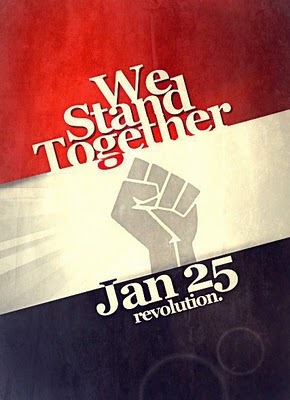 Tomorrow there is expected to be more than 1 million in Cairo, let alone many more in other cities. Change is in the air indeed. Access to all forms of mass communication, including the Internet, mobile and SMS, were taken down last night by the Egyptian government according to this report in the WSJ. a US/Israeli sig-int operation from offshore. Recall the uss liberty, taken out in 1967 lest it read and pre-empt Israeli plans for blitzkreig. Israel was still cognizant of US halter on Suez operation and did not want a re-run. Uncle Sam settled down to the inversion of the relationship after that and is now a happily married and decidedly uxorious spouse of AIPAC. The 34 dead and 174 wounded were buried in a mass grave, under the Oval Office carpet. 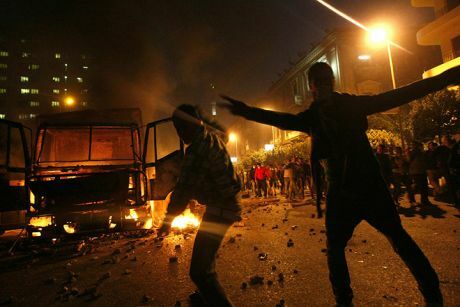 Protestors defy curfew in the heart of Cairo. 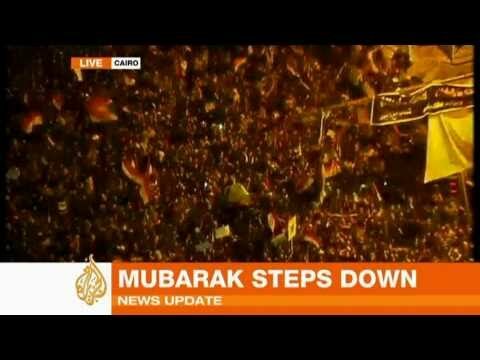 Amazing live video from Al Jazeera. Nearly 100 dead in Egyptian revolt - "Regime change. Mubarek must go!" Death toll stands at 95 at present, likely to increase. Army patrolling the streets, police stepped down. 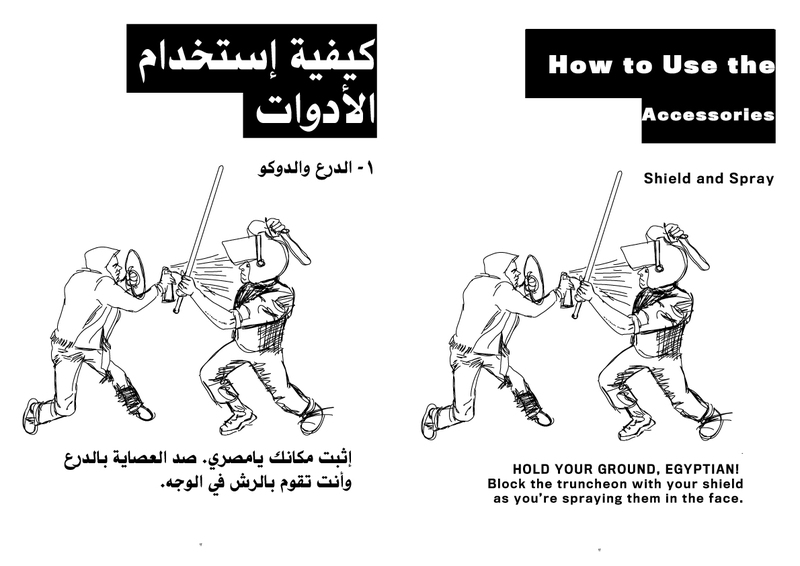 Cerfew called for 4pm local time (2pm GMT), likely to be disobeyed by the very angry Egyptians. Already 50,000 gathered in the main square Tehererin and growing, streets packed with people leading there. News just in that party headquarters in Luxor have just been torched (Al Jazeera). All the people are demanding the same thing: "Regime change. Mubarek must go!" 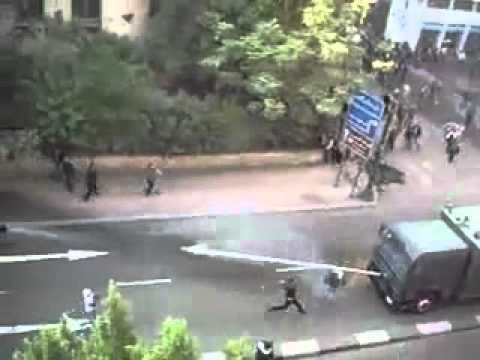 Egypt burns, 50 dead, huge rage now demaning "Mubarke must go"
In 20 minutes time we will see how the revolt panns out, will the army remain with Mubarek or go with the people? The cerfew will come into place officallly at 13h GMT, State TV in Egypt has stated that anyone in the streets will be in danger. People chanting 'the army & the people are one' and are giving the soldiers flowers, the army in their tanks are waving at the people and heeding the commands of the protesters by going down sides as directed, instead of crossing the principal bridge of the cerity, 6 of december bridge. There are reports that 8 more people have just been killed outside a prison were political prisoners are being held (presume the numbers of arrested over last 5 days is in the many thousands). Death toll is now over 100. The people still remain defiant, nothing short of the stepping down of Mubarek will do. Many support demos are happening globally. ..the cavalry to try and head off the rebellion and adopt a stance of leadership towards reform. Lot of dollars down that drain if it gets out of hand, and I'd say Israel is more worried than it has been for while. The Pharaoh totters. But he could totter on like Mugabe for a while longer. Its gonna cut back on their rendition destinations if the wrong half of the military takes it. If they can do the usual cosmetic plausible transition it will remain business as usual. Rumbles in Jordan, Yemen, Lebanon cranking up. Hillary and Tony wont be sleeping too tight. 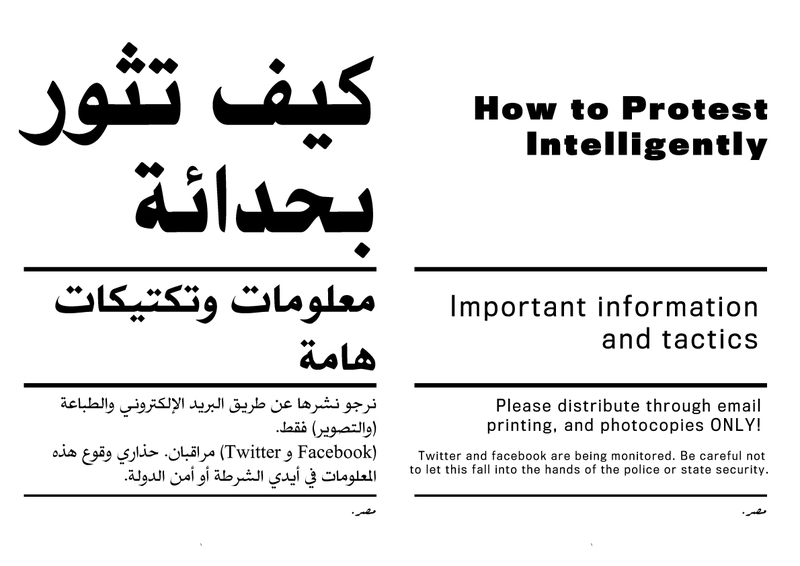 Twitter and Facebook can even topple dictators. What if it is worse Opus? The Americans kept the Egyptian regime on side in case something even worse arises in Egypt. The ease with which the Mubarak's US-backed regime was able to cut off web access in Egypt should serve as a warning to internet users everywhere. The US Congress is currently drafting bills to allow President Obama "kill switch" control over the internet during a "national cyber-emergency." Perhaps its time people started making alternative lines of communications. "There is a saying on Wall Street, attributed to 18th century British banker Baron Rothschild , that advises investors to "buy when there's blood in the streets." Should investors, then, buy assets (including but not limited to equities) in Egypt as other frightened financiers frantically sell?" Let's not lose sight of the fact that the democratically elected Obama is fronting for these vultures . At least 3 killed after 1000`s stormed Egyptian interior ministry. Presently one of the dead bodies is being taken through the main square with people chanting. The protesters who attacked the bank building in a Cairo suburb have been turned back by the army, who used tanks and fired shots into the air. The protesters, who were using wooden planks to try to break into the buiding, fled after seeing the tanks approach and hearing the shots. 2.23pm: Thousands of people are continuing to protest after the start of the extended curfew at 4pm (2pm GMT), Reuters reports. Defying an army warning that anyone violating the order would be in danger, the crowds thronged in central Cairo and in Alexandria. "It does not feel like there is a curfew, I can see thousands marching next to me," a witness from Alexandria told the news agency. The Devil and a Hard Place. The reason why Americans support some governments in nasty countries is because the alternative may be much worse. And where, do tell, does America, derive this right to impose its verdict as to what is better or worse? Dictated democracy is an oxymoron. Go see a movie. In fact try ' in the Valley of Elah' for a scope on the consequences. You can rent it cheap.Well cheaper than flying to Iraq for a full frontal assault. Egypt set for another day of protest, same call: "Mubarek must go"
Protesters camp out overnight at Cairo's Tahrir Square, while ordinary citizens battle looters in their neighbourhoods. I was beaten yesterday by security; you can see where they broke my rib. But I don't care – just look around you. The energy of the Egyptians is amazing. We're saying no to unemployment, no to police brutality, no to poverty. 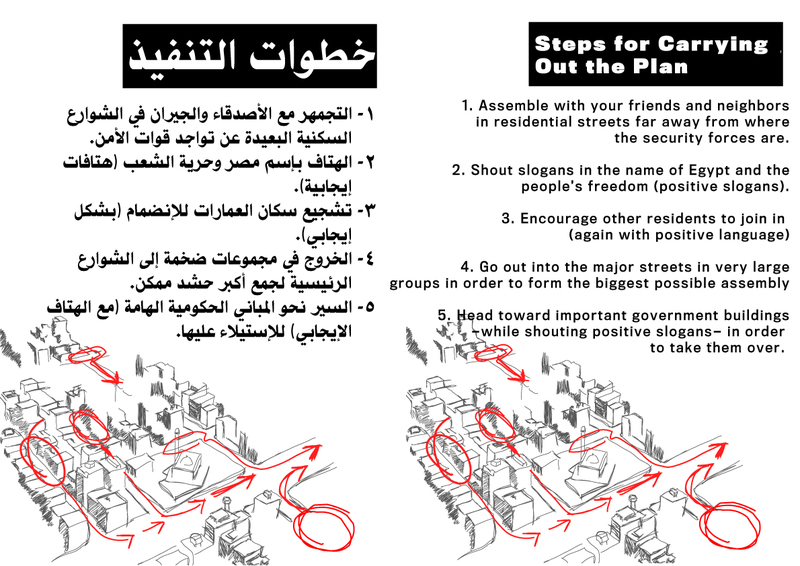 We saw how scared Mubarak and his regime was; they're being forced to listen to the people. Now the army is with us too, I'm sure of it. The job isn't completed yet but we're not losing any momentum. These protests will continue day after day until every bit of the regime falls. The psychological barrier between us and our president has been broken by teargas; the government created this uprising, and now they will face the consequences. I didn't come out on to the streets yesterday because it was a mess . But today feels different. The new regime will ensure our voices are heard. We mustn't forget the role of the US and the UK in all of this. The hypocrisy of [President] Obama was amazing; your western capitals have supported this regime from the very beginning – now suddenly everybody is concerned for our rights and economic security. Where were they before? 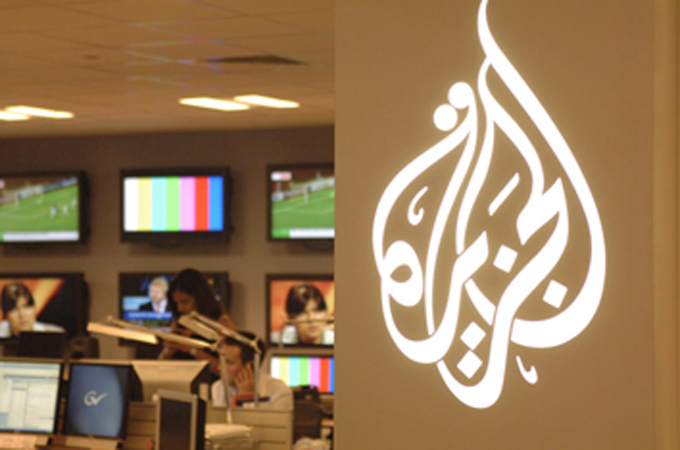 Egypt: Government plans to shut down al-Jazeera's operations in Egypt. 9.38am: The government plans to shut down al-Jazeera's operations in Egypt, according to Reuters, citing the state news agency Mana. "The information minister ordered ... suspension of operations of al-Jazeera, cancelling of its licences and withdrawing accreditation to all its staff as of today," a statement said. The New York Times reports on the influential role of al-Jazeera in the protests. The station was the first to report that the governing party's headquarters were set on fire. Breathless phone reports came in from Jazeera correspondents in towns across Egypt. Live footage from Cairo alternated with action shots that played again and again. Orchestral music played, conveying the sense of a long-awaited drama. Al Jazeera kept up its coverage despite serious obstacles. The broadcaster's separate live channel was removed from its satellite platform by the Egyptian government on Friday morning, its Cairo bureau had its telephones cut and its main news channel also faced signal interference, according to a statement released by the station. The director of the live channel issued an appeal to the Egyptian government to allow it to broadcast freely. 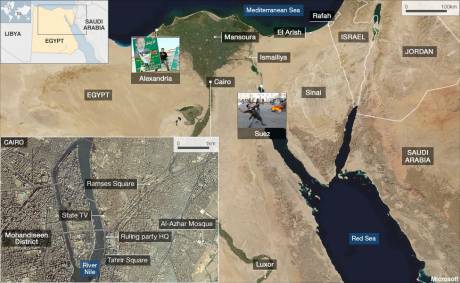 Al Jazeera Network is appalled at this latest attack by the Egyptian regime to strike at its freedom to report independently on the unprecedented events in Egypt." Network's licences cancelled and accreditation of staff in Cairo withdrawn by order of information minister. "Al Jazeera journalists have brought unparallelled reporting from the ground from across Egypt in the face of great danger and extraordinary circumstances. Al Jazeera Network is appalled at this latest attack by the Egyptian regime to strike at its freedom to report independently on the unprecedented events in Egypt." The Egyptian authorities are revoking the Al Jazeera Network's licence to broadcast from the country, and will be shutting down its bureau office in Cairo, state television has said. 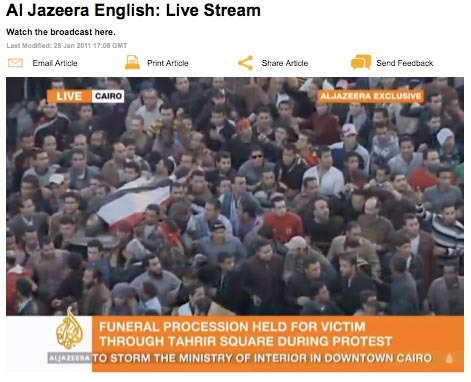 "Egypt's media department has decided to shut down the Al Jazeera channel,"
The network's Arabic-language channel was off the air in Egypt Sunday afternoon, but Al Jazeera English was still on the air. Tensions high, is today the big day? "MUBAREK HAS TO GO"
Today looks like the day it will go one way or the other. Will it be a Tienenamen day or a Berlin day? Still Obama refuses to demand "DEMOCRACY" for Egypt (as he has often quoted in other areas as being the most important thing). Victory to those on the streets, pushing for a true peoples revolution. "MUBAREK HAS TO GO"
..in that domino possibility. They're blocking the stories, according to al jazeera. "We should have taken steps before with this channel since it has caused more destruction than Israel for Egypt," governor of Minya province, Ahmed Diaeddin, raged on state TV. "I call for the trial of Al Jazeera correspondents as traitors." Mubareks man, Ahmed Diaeddin: "I call for the trial of Al Jazeera correspondents as traitors." Robert Fisk: It is over. "Mubarak Out – Get Out", and "Your regime is over, Mubarak" have now been plastered on almost every Egyptian tank on the streets of Cairo. On one of the tanks circling Freedom Square was a senior member of the Muslim Brotherhood, Mohamed Beltagi. Earlier, I had walked beside a convoy of tanks near the suburb of Garden City as crowds scrambled on to the machines to hand oranges to the crews, applauding them as Egyptian patriots. 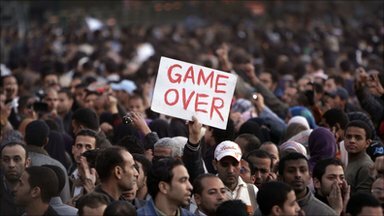 However crazed Mubarak's choice of vice-president and his gradual appointment of a powerless new government of cronies, the streets of Cairo proved what the United States and EU leaders have simply failed to grasp. It is over. Cairo, Egypt—I grew up in Egypt. I spent half my life here. But Saturday, when my plane from JFK airport touched down in Cairo, I arrived in a different country than the one I had known all my life. This is not Hosni Mubarak’s Egypt anymore and, regardless of what happens, it will never be again. That should focus the minds on the Nile. 1000`s injured, few dead, State sponsored terror violence- murabek must go!!! At present news is coming in that now the state thugs (both cops in civilian clothes as well as people paid big money to clear the anti-mubarek protesters) are targetting foreigners and media, already some have been beaten. Al Jazeera still refuses to give names on air of its journalists. Also the thugs are targeting the supply chain coming into tahrirn square, a women was on air talking abou how she was stopped by plain clothes men when she was going into the square with a bag full of bottles of water, she left the water and went away very frightened. People behind the barracades are very frightened but totally prepared to battle, if they have to, to the death. The feel that if they leave that they will be targetted and picked off one by one. 9.50am: Protesters say they have detained 120 people with IDs associating them with police or ruling party. Most were caught while attacking demonstrators, Reuters reports. 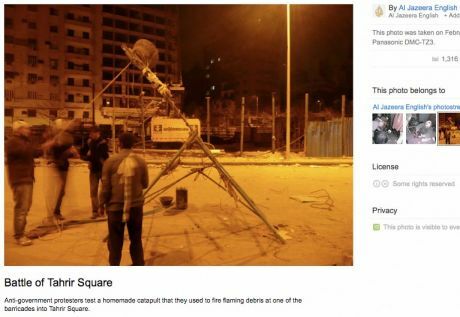 Anti-government protesters test a homemade catapult that they used to fire flaming debris at one of the barricades into Tahrir Square. 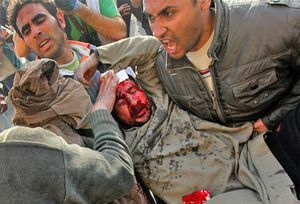 I done very nice work on Egypt protests: US call to Hosni Mubarak's government, visit it. 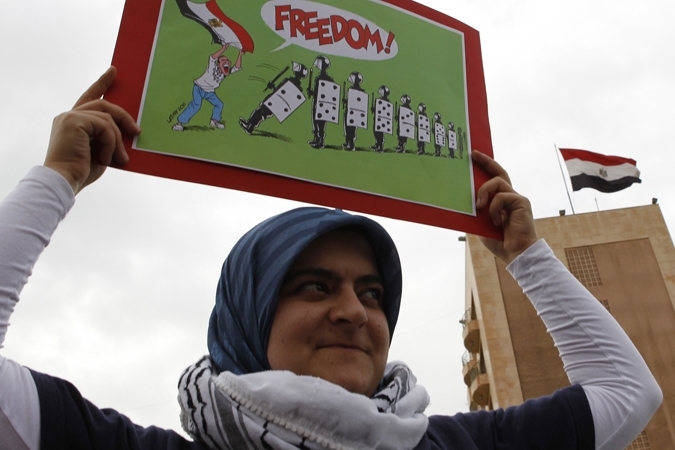 Ruling party officials suggest that President Hosni Mubarak may 'meet protesters demands'. Earlier, Hassan al-Roweni, an Egyptian army commander, told protesters in the square on Thursday that "everything you want will be realised". 3.08pm: Lindsey Hilsum of Channel 4 News is reporting that Hosni Mubarak is going to transfer his powers to Omar Suleiman, his vice-president, tonight. More as soon as I get it. Hilsum reports that Hossam Badrawi, the secretary general of Mubarak's NDP party, has told her in that over three meetings yesterday and a phone call today he convinced Mubarak to stand down and hand his powers to Suleiman. He will do this in a broadcast tonight, she says. I am also hearing conflicting rumours that Mubarak will use a speech on TV tonight to hand his powers to the army. It is unclear if this will mean martial law to clear the protests, or a permanent exit for the president. 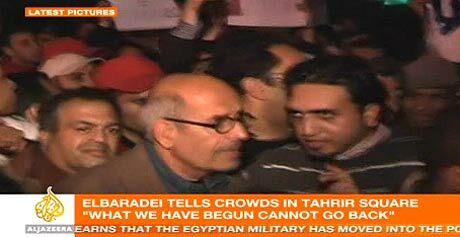 Badrawi has told BBC Arabic that Mubarak will "answer the people's demands" in the coming hours. My colleague Jack Shenker told me: "Protesters aren't certain whether they should be preparing themselves for a celebration party or a massacre." If it is true that Mubarak is going to step down tonight and Suleiman is going to take over then the Egyptian people should reject him too outright. Suleiman is a terrorist just like Mubarak. And why? Because they both have terrorized the people of Egypt for years. The Egyptian people should be very suspicious of anyone accepted by the military because that would just be a continuation of the status quo and very little will change. There might be some initial freedoms but the military will quickly roll these back. The Revolution has won, Mubarek has Gone!!! 4.02pm (GMT): Omar Suleiman is making a statement now. "President Hosni Mubarak has decided to waive the office of the republic." 300+ dead, many thousands injured, millions lost their fear and stood their ground, they held that ground "liberation square" despite ongoing attack of petrol bombs, rifle sniping fired from and rocks thrown from the rooftops,,, But, they won. Mubarek has gone. Well done to Egypt, now we will see where else this flame of justice spreads to in the middle east.